Stuck for ideas for newborn presents? Check out this list of great baby girl gifts that ranges from delightful personalized artwork for hanging on the wall, to outfits, clothing, and hair accessories to make a little one look even cuter. Celebrate the new life that has come amongst us in style. This delightful baby girl gift will help any family celebrate the new arrival. 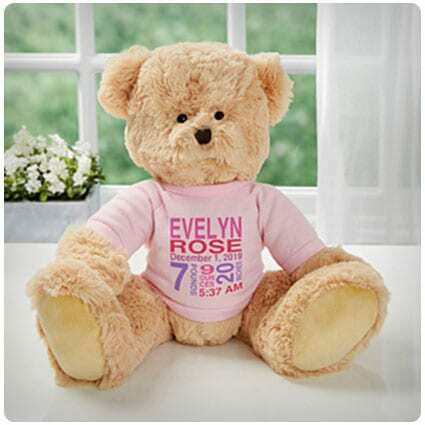 The plush bear measures over a foot tall and is made of silky polyester plush with 100% polyester filling. Incorporating the baby’s name and birth details is an added touch that makes this gift truly personal. Cast your favorite little one as a literary figure with this great make-believe book cover placed on a pillow. The character displayed can be customized to reflect the child of your choice and either parents’ names or the child themselves, can be displayed as the author. This hand-cut design is made in Baltimore and will show a reflection of how much you love your intended recipients in a fresh and dynamic way. A lunar lullaby personalized with a child’s name and birthdate makes this an instant keepsake that is sure to tug at the heart strings of all parents. Wherever you live in America, your state is special and is also something to be treasured by your newborn child. This personalized birth announcement displays your little one’s name and birthdate and celebrates the features of the state around you. A keepsake full of hometown pride. You may have settled beside a glorious river or a skyscraper but what makes a place is its people. Now you can celebrate your unique tribe with this personalized family and state print featuring the telling features of your locale and a proud display of your family name on this one-of-a-kind keepsake. Celebrate a new baby’s life story with this clever book cover pillow which features the baby’s and parents’ names as well as a dedication inside giving all the birth details. These pillows are generously sized and come in vibrant red or blue. A great keepsake all the way from Brooklyn, New York. Hang a sweet coat of arms on the wall to celebrate your little one’s arrival to the world. These charming colored pencil drawings depict delightful toys and animals around a shield that shares details of your recent arrival, including weight, size, zodiac sign, parents’ names along with the hometown, and state, of the baby. This terrific kit will produce a great keepsake of your baby’s first days that will be there as a reminder of when they were so small. Tiny toes and fingers are captured in an alpine white clay representation with this easy to use eco-friendly baby footprint and handprint framed package. For a practical gift that is also personal, you cannot beat these baby bibs with prints on one side and terry cloth on the other. The bibs can be embroidered with any name or monogram in pink thread and in a choice of 9 different fonts. Machine washable, these bibs are 100% cotton. This large swaddle blanket is a knit cotton blend and is bigger than most to offer more space for your kids. Usable as a blanket or for wrapping up warm when out with Mom or Dad, baby will be kept warm and snug in this soft wrap that is suitable for ages 0-12 months. As little ones grow at a rate of knots and parents find it hard to keep track of each step forward they take, this chart will make an ideal baby girl gift. The dry erase allows parents to record, and then rewrite, their achievements as they develop, on the personalized sign. This terrific book of puzzles comes with a personal message from the giver, along with a quiz based on a year that’s requested, be it for an anniversary, birthdate or other important occasion. Containing 50 pages of crosswords, word searches and Sudokus, this will be a delight to any puzzler. This gorgeous little black dress is ideal for a young baby girl and is made from 100% cotton. Ideal for a family photograph, wedding or party, the dress is soft and comfortable whilst being breathable and quick to dry. Machine washable, the entire set contains a bodysuit, headband and foot jewelry. More than just a basic teether, this Little Sprouts teether clip attaches to your little one’s clothing, teething ring or blanket. The bright chew beads stimulate visual, motor and sensory development as well as massaging teething gums and soothing teething symptoms. A strong and safe teether which will capture your baby’s attention. This custom luggage art makes a great gift for a new arrival. With a range of colors available for the tag, the image is enhanced with the addition of your child’s birthdate and their size on arrival, as well as their initial being made into a unique airport code. Cast your favorite little person as a literary character with this great artwork for the wall. You child’s representation can be customized in terms of skin tone, gender and hair options. There’s also a “review” of their story which makes this an unforgettable and timeless piece of art. This cover is great not only for breastfeeding but also as a stroller cover, car seat canopy, infinity scarf or as a shawl. Made from 95% organic cotton and 5% spandex, it is pesticide free, pigment free and hypoallergenic. Breathable and washable, this lightweight cover will protect you from everyday bugs. This personalized blanket is made from polyester and is a unique gift that shows just how much you care. Personalized with the baby’s name, this stylish design has great sensory stimulation, critical for development. The durable material can be washed repeatedly and still retain its design and color. This storybook artwork pillow will help anyone celebrate their new arrival or young child. The child’s name is paired with a playful animal while on the opposite side of the pillow, a record details important notes such as the birthdate, weight and height which makes this a delightful keepsake for any parent. Give the little person in your life the gift of a personalized book that will be a keepsake for their whole life. The book starts with a personal message from you before they engage in an illustrated alphabet that is filled with positive personality traits rather than simple everyday objects. This charming personalized book is designed to help your child to spell their own name and features their first and last name as well as their date of birth. In the book, animals who start with a letter from the child’s name, bring that letter until their name is fully spelled out. This gorgeous towel is made from organic bamboo fiber and is much thicker and softer than regular towels. The towel is also hypoallergenic, anti-bacterial and odor free. The towel sports a unicorn design which will appeal to the child and make it a fun item for necessary bath times. This delightful set of baby girl clothes are made from 100% cotton which is soft and warm and will not irritate baby’s skin. The pant features an elasticated waistband and a printed decoration whilst gentle hand washing or dry clean are recommended to preserve the softness of the clothing. This blanket will allow you to celebrate your little angel’s growth and will let you capture the memories of your baby’s first year. An ideal baby girl gift for an expectant mother or a new one, they will appreciate this premium polyester cotton blanket to wrap their little one in. This stunning canvas shows your child’s name that you took so much time over in its best light as the meaning of the name is displayed alongside. You can choose from 8 colors and 2 design options and even have the option to enter your own meaning for names without an historical meaning. This butterfly embroidered baby blanket is exceptionally soft and made from ultra fine 100% polyester microfiber. It’s machine washable and features a silky, satin coordinating rim all around to finish off its great look. Available in 4 fantastic colors, baby blue, pretty pink, grey or ivory. This print will be an ideal keepsake on a parent’s wall as it shows their young child as a fearless literary figure. The figure can be customized to reflect their child in terms of skin tone, gender and hair options, and there’s a custom review at the bottom of the piece, completed by the purchaser. This fun baby lounger is the perfect place for kids to relax in comfort and provide parents that hands free moment. The soft lightweight fabric and convenient cloth handle makes this an easy item to take along. The lounger is wipeable for small spills and fully machine washable for those of a larger nature. Make those family photographs more identifiable by having your baby display their age in months using these great stickers. Matte glare resistant and laser printed, these stickers require no glue or cutting but simply peel, stick and then click the camera’s button. A great gift that comes packaged for giving. This delightful romper makes a great gift for a new baby girl and is made of cotton/polyester making it perfect for indoor or outdoor wear. The adorable floral design gives this romper a cute look and with the additional headband your baby will be a stunner in the summer sun. Show your love for a little one with this gorgeous piece of art that is personalized with the baby’s full name and a special date. This canvas print depicts a golden antique moon and stars amongst a precious backdrop of pink hearts or blue stars. A perfect baby girl gift. This quality crafted wood frame features a high gloss laminate front with an easel back design for table top display. The design allows for all of baby’s birth information to be displayed in a repeating fashion whilst her name is featured on the front for all to see. These gorgeous little shoes are great for dressing baby up and will fit up to the age of 9 months. Made mainly from cotton, with nylon and spandex, the shoes come in an adorable box with a ribbon and are also machine washable in case of any accidents. This pack of 40 hair bow clips comes in a wide range of colors, one to match every outfit, along with a Ziploc bag to store them. Attached via crocodile clips, these hair clips will keep hair tidy and neat and allow your toddler to look their best any day of the week. This clever nursing and car seat cover can also be used on shopping carts and highchairs to keep baby happy and protected from outside influences. Discretion is assured when feeding, whilst the rayon fabric is breathable assuring a comfortable feed for your little one, hidden by this smart floral pattern. These cool onesies based on the Justice League franchise are made from 60% cotton and 40% polyester giving a soft, easy to wash fabric. There’s 5 suits in this pack with lap shoulders and 3 snap closures for easy dressing. Now we can all have a little heroine in front of us. Create a keepsake that will hang proudly on the wall of any room by following this creative blog that deals with making pictures from buttons. With a number of photographs to take you through the process, this craft idea will come naturally and easily and result in a great gift to give. Young girls always seem to have a large number of bows and hair accessories which can end up all over the house, and lost or ruined. This clever blog has ways and means to deal with these hair accessory losses and has many photographs to assist your understanding. For decorating houses on a budget, check out this blog that has a number of ideas and methods for making your own DIY chandeliers which look every bit as good as those in a retail outlet. Concise instructions and great photographs assist you on your creative enterprise. It can be hard finding baby shower gifts that will actually end up being useful or different to everyone else’s, but with these genius, super cute and helpful products, everyone will soon be coming to you for help buying neat gifts. The personalized charm of baby boy gifts is beyond compare. From custom-made wooden name puzzles, hand-embroidered bathrobes, and a tailor-made storybook pillow adventure, your wee lad will grow to appreciate his family, their love for him, and love above all. Baby gift sets do not have to be hard to find, not when you know where to look; the only place you should be looking is on the following page as the best sets have been narrowed down and compiled for your shopping convenience. Whether you’re looking for something pink or blue, or you’re opting for neutrals, we have a great selection of baby gift baskets for every mommy-to-be. There are whimsical, personalized, or practical choices to suit every nursery and fit every budget. Personalized baby gifts last long after their initial usefulness to become treasured family heirlooms. Check out this list for a wide-range of creative and unique choices. You will find something special for every baby.